Karin Eyben, writing for Voluntary Art’s series on Cultural Commons, tells the story of Garvagh People’s Forest. Karin Eyben: Garvagh (from Irish: Garbhach, meaning “rough place” or Garbhachadh meaning “rough field”) is a village in County Londonderry. It was developed in its current lay out by the Canning family in the 17th Century following the 1640s rebellion with land confiscated by the Crown from the O’Cahans. Garvagh once lay on the edges of the famous Glenconkeyne Forest which stretched from north-west from Lough Neagh, down the Bann valley, nearly to Coleraine, and across to the Sperrin mountains in the east. In 1607 this area was described by Sir John Davys, the Irish attorney-general, as “well-nigh as large as the New Forest in Hampshire and stored with the best timber in Ireland.” (Irish Woods Since Tudor Times, 1971). It formed in its day one of the biggest, and possibly the densest, oak forest in the country and became notorious for the hide out of the woodkernes; “a race of outlaws driven from their miserable dwellings by the Norman invaders, rarely emerging from their retreats in the impenetrable forests except in pursuit of plunder.”(http://www.clanmcshane.org/TheMacShanes.PDF) They became the most formidable enemies with which the first planters in Ulster had to contend with. By the end of the 17th century the woods of south Derry had become mostly depleted with the woods exploited by the Crown with the timber used for casks, barrels, buildings and ships. Garvagh Forest today is 600 acres and is a mix of broad leaf and conifer forest. From its more recent story as land ruled by different chieftains in Gaelic Ireland and managed through the Brehon laws, to private ownership through the Canning family who built the ‘big house’ in the forest to the state managed and owned from the 1950s as a commercial forest this small piece of land has evolved through different forms of ownership and management. Understanding this history and the complexity of people’s relationship with the land and the forest is a key underpinning of the Garvagh People’s Forest project. The story of this project began with the closure of Garvagh High School (also sitting on the former Canning estate) in August 2013. There was significant level of community grief and anger at the time which was gradually shifted to exploring the potential of a community asset transfer of the land from the Department of Education to community management. The feasibility of this is still being explored. However, during this process, a new conversation began noticing the asset of the neighbouring forest and to what extent understanding the value of the forest could contribute to wider community well-being. A year was spent testing out different possibilities in the forest, led by Garvagh Development Trust (GDT), a local development trust, with the support of Corrymeela, such as creative community events and establishing a collaborative relationship with a number of local primary schools to explore the value of young people learning outside. This year established enough evidence to allow GDT to apply to the Big Lottery for five years funding to grow the project. We were successful in this bid with this new chapter of the story beginning in August 2017. Contributing to greater physical and mental well-being framing this work through 5 Indicators of Well Being: Notice; Learn; Give; Move; Connect. Reflection, Learning, Evaluation, Community and Advocacy. 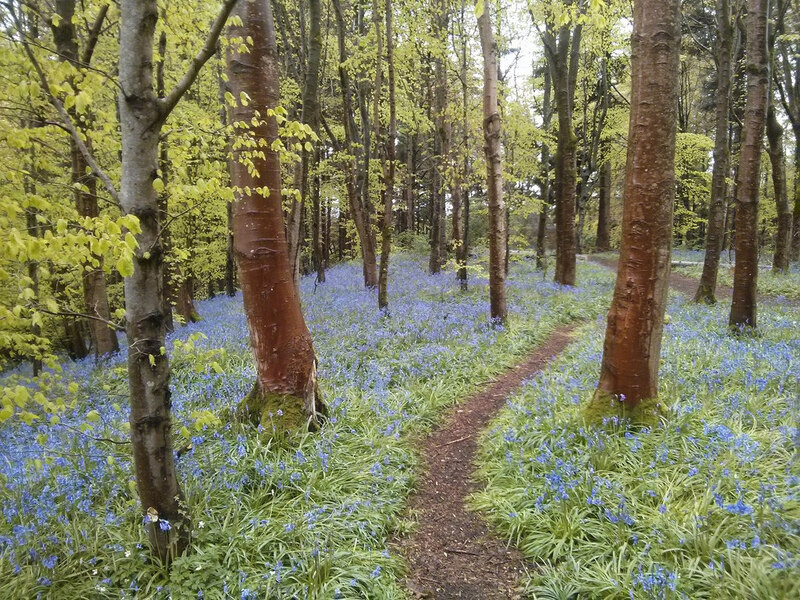 Garvagh Forest is already well loved by individual walkers, mountain bikers and families. Garvagh People’s Forest is building on these relationships with an invitation to shift from individual connections to exploring the potential of collaboration across individuals and local groups potentially sharing if not shifting the sense of ownership and responsibility with the Forest Service, local government and the State. Our dream is that by the end of five years there is a community-led integrated plan for Garvagh Forest informed by understanding of how the forest works, its biodiversity, social and commercial interests and most importantly that the forest is understood, shaped and used by local people through activity contributing to wider common good. So how does Garvagh People’s Forest fit into the ‘cultural commoning’ movement? The initial decision that began the project was a small act of creative courage as it was driven by intuition as opposed to any evidence. The intuition was that the forest is a key aspect of shared cultural heritage and well-being and that so much more value could grow from people’s relationship with the forest and the local environment if we worked collectively. The forest offers a difference space and tangible focal point for all kinds of commoning work as well as giving value to the work that is happening across Garvagh. We also firmly believe that the sharing of responsibility and ownership of the forest will be better for people, the environment and the place of Garvagh. We have recently crowd-funded for the purchase of nine Lost Words Books by Robert McFarlane and Jackie Morris for Garvagh Forest schools. All over these islands, there are words disappearing from children’s lives. Words like Otter, Bramble, Acorn, Dandelion, Bluebell are gone from many dictionaries disconnecting young people from the heritage, history and landscape around them. The loss of words is the loss of a relationship and the loss of the art of noticing and learning from our natural world and understanding our place within it. We hope that the next year we can shape our programme of work and activities in the Forest recovering the words that have been lost to the people around it.